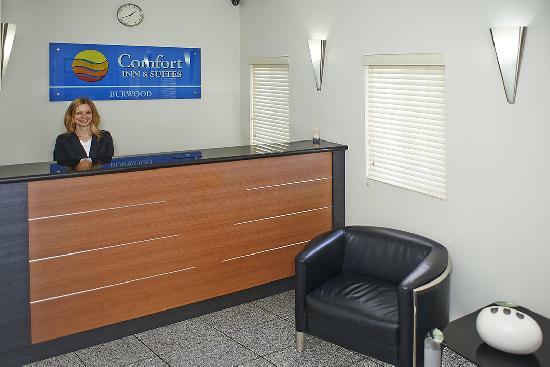 The Comfort Inn & Suites Burwood, Sydney is Burwood's newest and brightest motel, offering both fully furnished serviced apartments and motel suites - all quality rooms with high grade finishes at affordable prices. Our newly built complex has been strategically designed by our architects to combine a fine balance between both a contemporary and conventional theme. The end result of this successful and harmonious combination has created a timeless look and feel. All types of travellers can take advantage of the discount accommodation at the Comfort Inn Suites Burwood, as well as the range of modern amenities including conference centre, direct internet access, disabled facilities, faxing facilities, free car parking, guest laundry, lift, restaurant, bbq, garden and baby cots available. There is also a variety of restaurants including Italian, Thai, Chinese and take-away eateries within 50 meters of the Motel. We are convenient to public transport whereby a bus stop is located at our front door. Bus services include transportation to the CBD, Airport, Burwood and Strathfield Train Station. A connecting bus from Strathfield Train Station will take you directly to Sydney Olympic Park. Nearby Attractions : Homebush Bay, the home of the Sydney 2000 Olympic Games is just a short drive from the motel. Here you will find ANZ Stadium, Acer Arena, Sydney Showground, International Aquatic Center, Superdome, athletic, tennis, hockey and Golf centers, Sydney CBD lies within a 20 minute drive, making attractions such as Darling Harbour, Centrepoint Tower, Opera House and Circular Quay easily accessible, Shopping locations include Burwood Westfields, the Direct Factory Outlet (DFO), Birkenhead Point Shopping Center and Paddy's market, Nightlife locations include Burwood RSL, Wests Ashfield Leagues Club and Norton Street Leichhardt known as Sydney's "Little Italy". 1 Bedroom Queen Apartment : Sleeps up to 3 guests on 1 Queen Bed + Double Pullout Sofa Bed Extra. 1 Bedroom Queen Suite : Sleeps up to 3 guests on 1 Queen Bed And 1 Pull Out Sofa Bed. 2 Bedroom 2 Bathroom Apartment : Sleeps up to 4 guests on 1 Queen Bed, 1 Single Bed And 1 Pullout Sofa Bed . 2 Bedroom Apartment : Sleeps up to 6 guests on 1 Queen Bed, 2 Single Beds And Double Pullout Sofa Bed. Double Hotel Room : Sleeps up to 2 guests on 1 Double Bed . Family Hotel Room : Sleeps up to 4 guests on 1 Queen Bed & 2 Single Beds. Junior Suite : Sleeps up to 3 guests on 1 Queen Size Bed In The Bedroom, 1 Pull-out Sofa Bed . Single Hotel Room : Sleeps up to 2 guests on 1 Double Bed . Studio Queen Apartment : Sleeps up to 2 guests on 1 Queen Bed..